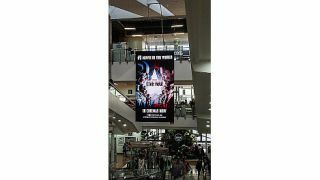 oOh!media Limited has teamed up with NanoLumens to design a digital advertising display in the Mirvac’s Broadway Sydney, a shopping centre in Australia. The installation is comprised of a double-sided 4.5MM pixel pitch NanoSlim banner that measures 2.44m wide x 4.42m high (resolution of 512 pixels wide x 928 pixels high) and weighs a mere 573kg. When it came time to design an LED display for this marquis installation, Rubie knew that an ordinary display wouldn’t live up to oOh!’s commitment to providing advertisers with an “unmissable” out of home media solution. For NanoLumens, the Broadway installation is their first heavily trafficked retail location in Sydney.